Recently forage testing laboratories have begun to evaluate forages for neutral detergent fiber (NDF) digestibility. Evaluation of forage for NDF digestibility is being conducted to improve laboratory prediction of animal performance. 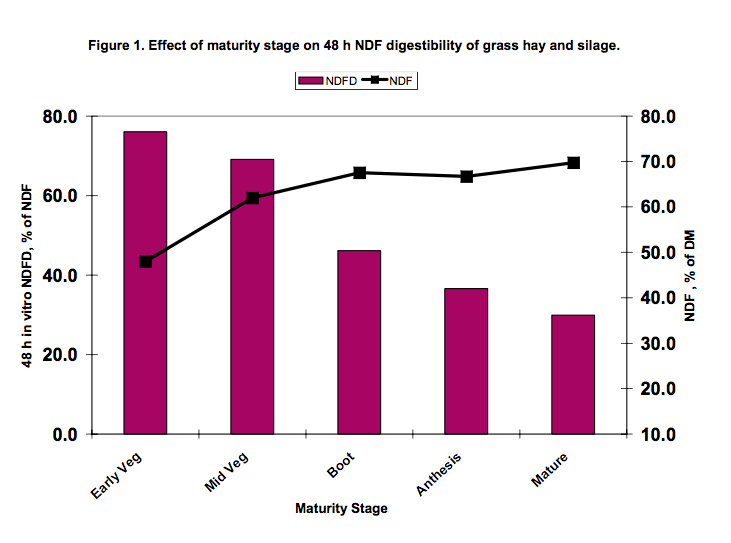 One of the factors that influences NDF digestibility is the maturity stage at which the forage is harvested. This Focus on Forage article will highlight the effects of maturity on forage NDF digestibility. How does maturity affect forage NDF digestibility? As forage matures, NDF digestibility can decline over 40 percentage units (% of NDF). Figures 1 to 4 of this article feature the classic relationship of increasing NDF content of grasses, legumes, corn silage, and small grain forages with advancing maturity. Each figure also details the decline in NDF digestibility with advancing maturity. The rate of decline in NDF digestibility is, however, different between forage types. 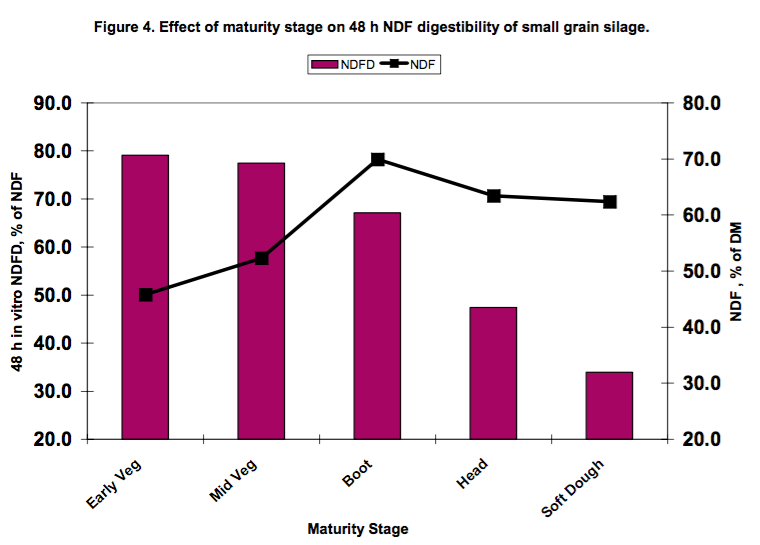 The decline in NDF digestibility in grasses and small grain silages is particularly dramatic (Figures 1 and 4) with advancing maturity. While grasses and small grain forages are in the vegetative state, NDF digestibility is very high (> 70% of NDF). When stem elongation occurs in grasses and small grain forage, NDF digestibility declines at a relatively fast rate. 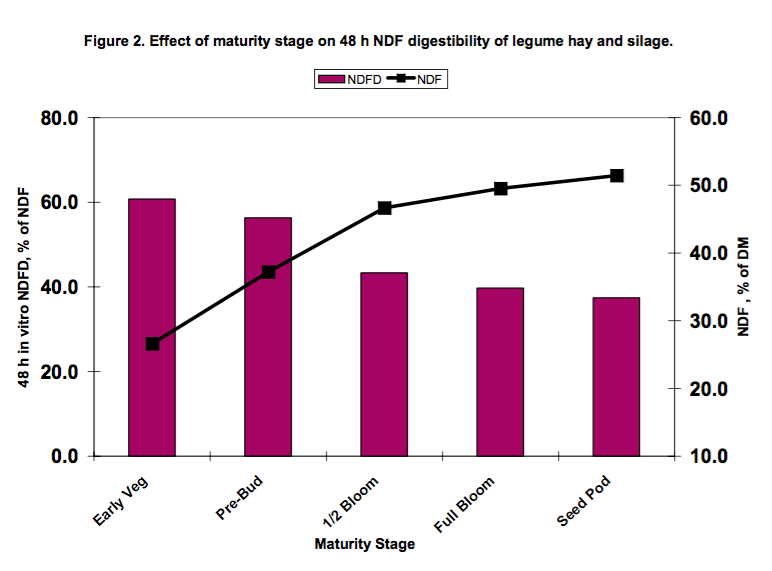 In legumes (Figure 2), NDF digestibility is less as compared to grasses during vegetative stages of growth but declines slower and in a more linear fashion with advancing maturity. Finally, NDF digestibility in corn silage declines approximately 10.0 percentage units between the 1⁄2 milk-line to advanced black layer stages of maturity. Why does NDF digestibility decline with advancing maturity? With advancing maturity, all plants, including grasses, legumes, corn, and small grains, undergo physiological changes. With advancing maturity, plants develop xylem tissue for water transport, accumulate cellulose and other complex carbohydrates, and these tissues become bound together by a process known as lignification. The combined effect of physiological changes results in plant cell walls (NDF), which are more difficult for rumen bacteria to attach to and to digest. One simple, practical aspect of maturity effects on NDF digestibility in forages is related to changes in leaf-to-stem ratio. The NDF in legume or grass leaves is significantly more digestible than NDF in stem tissue. As forage matures, leaf-to-stem ratio declines (more stem, fewer leaves) and as a result NDF digestibility declines because a greater portion of the total NDF is NDF associated with stem tissue. 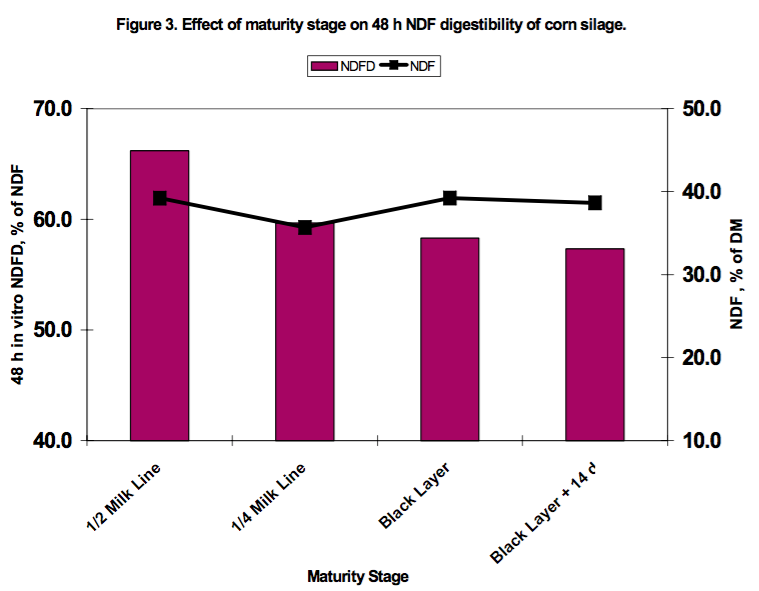 Corn silage is unique in defining maturity effects on NDF digestibility because leaf-to-stem ratio is not greatly altered across normal harvest maturity stages. It is actually common to observe a decline in total NDF content in corn silage as the corn plant matures. This is because the corn ear is filling with grain, which dilutes the total forage NDF content. Despite this illusionary maturity effect, the NDF digestibility of the corn plant still declines with advancing maturity (Figure 3) mainly due to advancing lignification of cell walls (NDF). How can forage NDF digestibility be best managed? There is really nothing new as to how to manage forages to optimize NDF digestibility. Forages should still be harvested at their traditional stages of maturity (grasses = boot, legumes = bud, corn silage = 1⁄2 milk line, etc.) to maximize both yield and quality. Understanding the decline in NDF digestibility with advancing maturity simply places a double emphasis on harvesting forages at their proper maturity. We now understand that as forages mature, they accumulate more NDF, which decreases forage energy content and the NDF that is accumulating is becoming less digestible. This entire effect results in forages becoming less digestible at an increasing rate as maturity advances.